You can enter Moto G silent mode, or vibrate mode to silence Moto G notifications and ringtones easily. In Android lollipop, you can have more controls in Priority mode. Update: this guide was written for Moto G, Moto E and Moto X, with KitKat 4.4. If your Moto G, Moto E or Moto X has been updated to Android Lollipop 5.0, and you want to silence Moto G, Moto E or Moto X, please check this new guide for Android Lollipop (which uses a a totally new notification and interruption system). 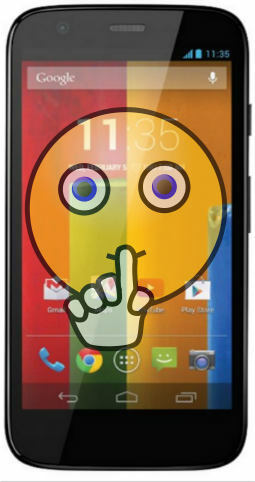 Have a problem to silence your Moto G? There are 2 different methods to silence Moto G notifications and ringtones. Sometimes, for example, in the library, you may want to quickly silence Moto G notifications and ringtones. If you want to know how to silence Moto G ringtones and notifications, this guide is for you. You can put Moto G in vibrate mode by holding down the volume button on the right side of Moto G until your Moto G vibrates. This is the quickest way to silence Moto G. But you know the limitation: Moto G actually enters vibrate mode. It will not ring, but it will vibrate. If you do not want Moto G to vibrate, use method 2 to completely silence your Moto G.
Of course, you should hold down the volume down button while Moto G is not playing music or videos. If the music player or video player is running when you press and hold the volume button, it will simply silence your music or video. It will NOT silence Moto G notifications and ringtones. So, normally, you should exit music player or video player before holding the volume down button. After your Moto G enters vibrate mode, you can play music or video as usual. Vibrate mode is for ringtones and notifications only; it will not silence your music or video. Method 2: Silence Moto G ringtones and notifications completely. If you do not want Moto G to vibrate as well, in other words, silence your Moto G completely, you can put Moto G in silent mode. Touch Silent mode to silence all sounds (including call and notification ringtones) except media and alarm (you must silence media and alarms in their own applications). 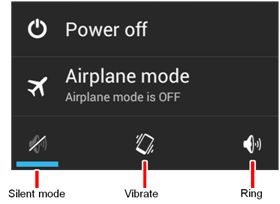 Of course, you can also put your Moto G in vibrate mode here by tapping the Vibrate button. How to stop silencing Moto G? You can stop silencing Moto G ringtones and notifications by tapping the volume up button on your Moto G.
Again, you should do this when you are not playing music or videos. Otherwise, it will only change the volume of your music or videos. Of course, you can also use the Ring button as shown in the image above. Why I can not find the Silent mode or Vibrate mode? If you updated your Moto G to Android Lollipop, you will NOT be able to find the Silent mode or Vibrate mode. In Android Lollipop, a new notification and interruption system was introduced with three modes: All, Priority and None modes. Please follow this guide to silence Moto G notifications and ringtones if your Moto G is running Lollipop. Do you have any problems to silence Moto G notifications and ringtones? Please let us know in the comment box below. I’m trying to turn off the vibrations by pressing the down volume button but the music volume is the only thing that comes up. I don’t have any videos or music playing. You can turn off vibration in notification sound in Settings. Well I never, ever got my phone to work as it was supposed to and decided to wait for the promised upgrade to Nougat. And wait, and wait, and wait. And that never came either. I like Moto phones but I hate Lenovo’s attitude to its customers and its secretiveness. My new phone isn’t going to be a Moto and I just shied away from buying a Lenovo touch screen desktop even though the specs made it the best option. It depends on what you want. Some features are available in the phone; some can be realized through apps. Clearly I’m not referring to apps. Incoming calls should NOT unlock the point. So, it’s normal. Screen should light up very briefly when it rings. You can pick up the phone or motion is detected, it will then light up. Hi I want to silence notifications for Gmail, Whats App etc on my Moto G4, but have the phone ring I cannot find this setting, is this this possible or do I have to have all alerts on vibrate or silence? You can set notification tone inside these apps. By default, these apps use the the default system settings. But most apps have own notification settings. For example, for Gmail, each account can has own notification tone. Open the app, tap the navigation menu (3 lines in top left), tap settings, tap one account, you can set notifications for this account. Once notification is enabled, you can set notification tone for this account. You can also find notification tone settings in WhatsApp. hi , actually i love this mobile but i have a problem with it sometimes it stop ringing without doing any adjust with volume or mode ,, it just go silent it self ,,, also sometimes i face a problem when i but true caller app. also it make complications with phone ring ???? any idea what should i do ? Did you turn on any Do not disturb settings? When the phone didn’t ring, did you get missed call notifications? I too have the same problem in MOTOG4 plus-It gets in to silent mode with out any intervention. When it goes in to silent mode I have to swirtch off and switch on every time. Can any one give a solution ? I want to reduce my notification volume without reducing ring tone volume.How can i accomplish it? Moto G use the same volume settings for ringtone and notification tone. You cannot use different volume settings for them. But you can use different music file (with lower volume) for notification tone. How do i turn on my sounds of moto G 3 Marshmellow,. ?My phone’s volume is full but no sound was there but its vibrating. And also while i am playing music i am not able to hear any sound. But while i pick up any calls i m clearly able to hear the sound properly?? What’s Settings–Sound and notification? You can post the screenshot in our facebook page. How do I turn the vibration completely off on the Moto E lollipop? My phone still vibrates loud when it rings? Settings – sound and notifications, turn off also vibrate when ringing. My G4 ‘lift to vibrate’ function won’t work. I’ve turned it on but the phone keeps ringing until I answer it or it goes to voicemail. Did you try the on-screen tutorial? You need pick up and rotate about 90 degrees as shown in the tutorial. I didn’t know about the rotation. Thanks. Hmmm, it doesn’t stop ring when I rotate it either. Can you finish the on-screen tutorial? To reset Moto G default notification tone, you can go to Settings– Sound & notification –Default notification ringtone. I have bought Moto G4 Plus (Andriod 6.0 – Marshmallow). I can keep my phone into vibration mode but I don’t find silent option. When I press and hold power button it displays only “power off” option, it doesn’t show other options. Please suggest how to keep my phone on silent mode. Is there a way to turn down the volume of the ring to even quieter than the factory setting for the lowest volume of ring? I’d like a quieter ring that is just above vibrate but below the next level of my Moto G2 and I already use quiet ring tones that I downloaded. You can try to use your own audio file with softer sound. What would be the most effective way to do that? I’m trying to use ambient noise that is seamless with what would be audible in the room anyway (car noise, sparrow, etc.) so that only I know my phone is ringing. hi. i am using Moto G 3rd Gen. i need to reduce the volume of notifications. please guide me for this. if i follow the above procedures, the fone is getting into silent or vibrating mode. i dont want that to happen. i jus need to reduce the notifications. will be glad if you could revert on this. Settings–sound& notification, you can find the volume settings for ringer. I am using Moto G 2nd Gen… Lollipop.. I have setup specific ringtone for a contact, but apart from calls, I am also getting the same ringtone for the messages from that contact. I want to customise this.. Kindly help…. No, Moto G does not offer customized notification tones for individual contacts. The pre-installed contacts app does not have this option. What is the OS on the phone? KitKat or Lollipop? What do you get if you press volume down? i am using moto g 2 gen, i tried so many times to put silence but no use. when i Press and hold the power button until vibration. The following box doesn’t show up in the center of the screen in my mobile as you mention.it shown only power logo(power off) unlike silence mode,vibrate,ring. You can set the default notification tone as “none” in Settings–sound and notification –default notification ringtone. When I go to power off, the phone vibrates. I want to turn this off. Sure I can set to silence, but that also shuts off ringtones when using the phone. I just want to get rid of the vibration at power off. I don’f think there is such a control. Anyway, you should seldom power off the phone. It should not bother you too much. Hi, I upgraded the android to Lollipop and since then I can’t turn off vibration. If I press the power button there are no other option then power off. If I press the volume button as previously there is no option to switch off vibrating either. The only solution to switch it in aeroplane mode but then I don’t receive any messages and emails. Please help because vibrating does a quite loud buzzing which is very annoying meanwhile sitting a meeting. Thanks! For vibrations, in Settings– Sound & notifications, un-check Also vibrate for calls. I have exactly the same problem. I like to use my phone in bed, but the vibrations of the key pad input is very loud. This happens even when I am in silent mode, and also all vibration options are unchecked in settings-sound. It is very annoying and indiscrete, and it has always been like this ever since I bought the phone 6 months ago. I’m considering moving to a different brand of phone with a decent camera and ability to be silent for real. Are you talking about vibrate when pressing the keyboard? You can turn off vibrate on keypress in the keyboard settings. It’s under settings – language&input- Google keyboard- preferences. You can turn off vibrate on keypress and sound on keypress. you should ask your phone company to set up conditional (e.g., not reachable, or not answered after 5 rings…) call diverting/forwarding to voice mail. Don’t mess up the call forward in phone app in your Moto G. Your carrier may not respect it at all. I am using Moto g 2nd gen.KitKat version. The bottom speaker doesn’t work at all because of which i cant switch on the speaker phone during calls and also no notification sound is played whenever i receive any message/mail. Can you please help me in resolving this issue. Did you check the volume settings? When in a call, did you transfer it to speaker? If factory data reset doesn’t solve the problem, you probably have to visit local service centre to check the hardware. I just bought a Moto G Second Generation and I cannot get any sounds for whatsup,email,and texts message .. How do I fix this?? In My MOTOG first generation with Lolipop os, i had sat a ring tone on call but when any call arrived on my mobile at that time ring is not working instade of one voise message is like “Call from unkown person say yes to answare” like that. Now i dont want it, i want ring back then what to do? Are you using motorola assist app? Do you have some icons in the left side of the status bar? yes…!!! I got the solution thanx for giving me helpful replay and save my phone to factory reset..
i dont ge an option like silent while pressing the power button..it only displays ower off//what can i do? This is invaluable. I have been losing my mind today. Thank you!! I just bought a Moto G Second Generation and I cannot get any sounds for fb app, fb messenger app or texts.. How do I fix this?? First, check volume settings in settings – sound. You may also try to change notification tones to see whether the new one is played when changing. Please note Facebook has its own notification settings. You need check them inside the app. This is normal and it should work in this way, as I know. When speaking on the call and some new no being narrated how can I use key panel to enter the new no and retain ? What exactly do you want to do ? You may provide more details so that we can understand it correctly. Did you try different ringtones? Settings>sound>ringtone> like this I have tried. But its showing unknown ringtone and caller tone not coming sound..what to do? Please guide. When you go to Settings -sound – ringtone, what exactly did you get? Can you follow the guide mentioned? Did you install any ringtone apps? I am trying to set my ring tone in my moto g2 but it’s not ringing..I am facing this problems from 10days please..give me some idea..all tones are ringing but like message ,notification ringtones.its coming only in caller tone setting. Of course, it’s possible. But there are a few possible scenarios depending on apps you are using. You can set notification tone as silent on settings-sound. Some apps may not respect this setting if they have their own notification tones. In this case, you have to set the notification tone inside these apps individually. If you don’t want to get the text notifications from these apps, you can disable the notification from these apps completely in settings – apps. I’m trying to silence my phone but when I press the power button, all I get of power off. That’s it! Is there any other way to silence the phone? Very likely, your moto g was updated to lollipop 5.0. You can use volume button to get the options. But it will be slightly different. You can choose none or configure priority. Thank you! I’ve been very frustrated with this problem since I updated last week. It’s taken me days to find a forum with the answer. Inside the app, you can find the settings to disable it. This is app specific settings and therefore you should check the settings inside the app. is there any chance to adjust the volume of notifications and ringing individually? or else any alternative solution for this? I’ve turned my video and game volume all the way down and it won’t turn back up also can’t hear or be heard on phone calls unless I put it on speaker how do I fix this? You can try to backup your data and do a factory data reset. If factory data reset doesn’t help, you need visit motorola service centre to check the phone. Hi, option 1 doesnt work for me, i try pressing the down on the volume bottun and it doesnt turn into vibrate mode,it stays on a lower sound option. If you hold the volume down key, does it change anything? No, that’s exactly the problem, it moves down, it also shows on the screen that it moves down but it doesnt change into vibrate mode at the end. It used to do so but in the last week it just stopped. What should i do? Did you try to reboot the phone and try again? Not sure. Maybe it is due to some other apps or settings. If you really want to try, you can try to reboot the phone into safe mode to see whether you have the same problem. what do mean? reboot into safe mode? Yes, reboot into safe mode to see whether the problem is caused by third-party apps. To reboot Moto G into sage mode, you may: press and hold the Power button, tap and hold Power off option, you will then be asked whether you want to reboot the phone into safe mode. Once in safe mode, you can check the phone whether still have the same issue. You can reboot normally to exit safe mode. All the settings are inside the app itself except the volume. For volume, you can go to settings – sound – volumes. You may also turn off audio effects. I tried it simon…but no luck…how is it possible that it works in Samsung phones but not in moto phones?? Is there a way that the screen lights up when a text has been recieved? I’m sure I had it before but I must have clicked something to turn it off plz help! I think this corresponds to some accessibility settings in most Samsung phones. It is designed for people with hearing difficulties. I don’t think Moto G have this. Maybe some apps can do this. Ho do I disable the vibrate whenever I receive a new text message. I have tried disable in the original sms app, tried third party apps but it still vibrates when I get a new text message. What’s the default app for sms on your phone? Are you sure they are sms messages? You can tap and hold the notification,them tap app info to find out the app that handles the specific notification. Thanks Simon, the app info works and I found the culprit. I purchased a moto G (2nd Gen) on 17th oct ’14 through flipkart.com. during an incoming call, if my earphone is connected to my phone,it is not ringing through loud-speaker (Actually it is ringing through loudspeakers ,but in almost inaudible volume ). Could you please tell me the reason behind this ? And could you please tell me how to ‘activate’ the loud-speaker properly ? I think this is normal. If you at using headset, the sound should go to the headset including ringtones. Does it ring through your ear phone? 1. The volume (through loudspeakers) in which the phone is ringing while Motorola earphone is connected is varying from ringtone to ringtone ( e.g. when “moto” ringtone is selected, the volume is a little bit higher than in the case when “simple” ringtone is selected. ) . but still the volume is almost inaudible. Like, I have to place the phone near my ear to, actually confirm that , “yes,it is ringing !”. That’s why previously I thought, the loudspeakers are remaining inactive while ringing. Now,this was the case when Motorola earphone was connected. 2. But, when I connected my Nokia earphone to my mobile the case was totally different. The ringer volume from loudspeakers was very good ( exactly as it should be) . But in case of Motorola earphone, why the volume is so low ?? Almost inaudible ?? I think it’s normal if your earphone is connected. There is no reason to ring through the speaker if earphone is inserted. This is my understanding. Nokia earphone is slightly different from others. Not able to reduce volume in my moto g and any one can help me? Settings — sound — volumes? I wanted to know the 2 option in Moto G 2nd Gen..1) Where is the spam box or folder. 2) Rejected list means i should not get one missed call from rejected no. How to enable a sound-off button in the “speed-settings”. I mean, in the panel you get to by swiping down in the home screen and touch the symbol up right. Touch and hold the volume down button until you feel the vibration. The phone now is in vibration mode. To exit vibration mode, tap volume up button. The volume level will be shown on the screen. When I listen to music with my phone put on silent mode, the music doesn’t stop or pauses if there is any incoming call or text message. Is there any change in settings I need to do for that? still i am getting vibration while typing. It’s under keyboard settings. Go to settings – language and input, tap the settings icon for Google keyboard. You can then un-check vibrate on keypress. Hi ! While im trying to use Play music to listen songs..only the song which i’ve selected is getting played but not the next song after the completion of one song…I mean to say that what all the songs there in the list are not getting played, I had to select another song after completion of one each time. Could you please help me out of this. You need create a playlist, or tap shuffle all. How to assign default ringtone for watsapp in MOTO G? It is under keyboard settings. Settings–language & input, tap the settings icon next to Google keyboard, uncheck vibrate on keypress. Hi Friends, My MOTO G is going to slient mode every day night at 11 PM. How to stop it going to silent MODE. Am not sure again when it comes out from that silent mode because if I see aroung 11 or 11:30 I am changing manually. else by morning it is fine. ?yes i got that… but how can i add a sound so it makes a sound when i plug in a charger ? There is no such an option on Moto G. You may check whether there are any apps for this. the folder is read-only. You can access the folder with ES file explorer. But you cannot modify it unless it is rooted. Settings – sound -volumes. You can set volume for media, ringtone and alarm individually. The silent mode is for notification/ringtones only. thanks simon, that certainly makes life easier… now all i need is a way (or app) to make the volume control all 3 options simultaneously, any ideas? Actually I have set EST file explorer as default.But I wanted to make the notifications silent.Now I couldn’t make it to silent as I am unable to access the media tones.So how to bring the media option or how to reset it back from EST file explorer to default media. Because you chose “always”, it uses the app without asking you to select each time. You can clear defaults in settings – apps – es file explorer. I am not able to change font style.how to change wre z d settingd for ds…? The default launcher only allows you to change font size in Settings–display, but NOT font style. When i talking in the phone i am hearing apponent voice very loudly wtout putting in loud speaker if i reduce the voice for once it ‘ ll be k but next time i cald then only the same problem….plz help..
Did you check the volume levels at Settings-sound? You may also try to turn off Audio effects there. I bought a new moto g mobile and till yesterday it was working good but yesterday the green button while answering the call was not working, still it is not working. Did lot things like switch off and sim removel but could get solve the problem. What should I do now..
Do you mean you cannot accept the call? How about rejecting the call? Is it working? There is no minimizing option on android. The back button usually brings you back to the previous page, for example, chrome browser. But some apps may just exit. It fully depends on the implementation of individual apps. The home button is trying to push the app into background. Some apps may continue to run in background. But most will exit. Android tries to cache them in ram if the ram is enough so that you can open it faster and start from where you exited. Of the ram is not enough, android has a algorithm to close some apps to free some memory. My moto g has suddenly stopped making sounds. The alarm sound works, but the ringtone, and alerts do not. I see on this forum that I can unsilence the phone by holding down the power button and the putting finger on the mute button. When I hold down the power button I see the mute has a slash through it and a blue line underneath. When I put my finger on this the screen goes black and I am back to home page. Tapping the volume up key does nothing. Did you check the volume at settings – sound? You may also try to turn off the audio effects in the same setting page. I purchase my Motorola g about a week ago….the only problem I’m having is I can’t hear any music or hear videos..but I can hear my ringtones and notifications. What can I do? When playing music or videos, tap the volume up button. The ringtone volume on my Moto g randomly goes to silent mode. This is causing me to miss calls and messages. Do you have any idea why this is happening? Is there any way to lock it on? There is no way to lock it. When the volume down or up button is pressed, it may change the volume of ringtones. You may enable vibration together with ringtones so that you can get notified easier when it’s in the pocket of on the table. Ive got an ringtone issue. Ive got one contact with a customised ringtone. When I set my phone in to silent mode, a call from said caller still rings loudly. Any other call is silent like it should be. Isnt there a possibility that when I put the phone in silent mode, all calls are silent? Settings–language & input, tap settings icon next to Google keyboard, uncheck Vibrate on keypress, and Sound on keypress. how do i keep one sim silent and another in general mode in moto e? I don’t think you can silent one sim card only on Moto E. You may check whether there are any apps for this. I don’t how any adios that can do this. i got my mobile one week back. its got automatically switch off and not getting on.will u help me out for this. You may check whether it can be charged. Anyway, if it cannot be turned on, you probably have to visit the service centre to get it repaired or replaced. My moto g has no sound. the volume is on full and the speaker shows on. If i make a call i cannot hear it either through the phone or the speaker. It remains completely silent. You may visit Motorola service centre to check the hardware and fix it. How can I stop sound notification from app like news app, whats app, hangout at the same time keeping the mobile in ringtone mode? Is it possible? Settings–apps, find each app that sends annoying notifications, uncheck “show notifications”. You can also set this once you receive the notification. Tap and hold the notification, then tap app info, you will be directed to the app details page. You can then uncheck show notifications. Go to Settings- language & Input, tap settings icon next to the Google keyboard, uncheck vibrate in keypress, uncheck sound on keypress. When my phone is ringing,i touch screen,then it is vibrating..how i stop it?? Settings-sound, you can uncheck 1). vibrate when ringing; and 2). vibrate on touch . When I switch to silent mode and keep my phone aside, and later i hear notification ringtone when a msg is received, I was shocked to see it was no longer in silent mode, again i kept it in silent but the same thing repeated, and i had to switch of my phone!!!!!! 🙁 what is the problem? Are you using any third party messaging apps? Hi 1. For a single contact ring is not coming when that person called me. I don’t know how it was set. I checked particular contact ringtone, it is fine, but not getting ring. Anyone please help me how to remove silent. In addition to settings in People and Phone apps, some settings in Motorola Assist may also cause such behavior. You may deselect (uncheck) all options in Meeting and sleeping assist to see whether it works. 2. Settings–Language &input, tap the setting icon next to Google keyboard, uncheck “vibrate on keypress”. I generally put my mobile on silent mode while sleeping and also set the alarm for morning. In the morning the alarm rings but for couple of days I’m experiencing a strange behaviour. The speaker doesn’t work , rather any sound output device doesn’t work. Then I have to restart my mobile to bring it to normal. ya, if i choose vibrate for short or long, then when my phone is in general mode it vibrates then also. and if i choose default then it vibrates too. i want my phone to vibrate only when it is in silent mode, and otherwise i don’t want it. I don’t think you can configure it without using third-party apps. Inside whatsapp, tap menu key, tap settings, under notifications, you need set the vibrate to Short or long. Inside email app, Facebook app, there are notification settings for them individually. You need change the notification settings in each app. Moto G does not have this feature. You can set power button to reject the call (settings–Accessibility) . How to set sim 2 to silent mode and sim 1 in normal mode.. My sim 2 is my professional ph no so i want it to be silent always and sim 1 to be general mode.. There are probably no such settings in Moto G. All sound settings are applied to both sim cards. Moto G does not have the option of adjusting the vibration intensity. There are a few apps in the play store, but it seems none of them works on Moto G.
Where at the default notification sounds stored? When I connect my mob to PC I can’t find those tones? You cannot find it from your PC, because the folder is not mounted when connecting through USB. How can I keep different ringtones for dual Sim? There is no individual ringtone setting for each sim card. I think the best solution is to turn on notification, but set sound as none and un-check vibrate. For email, whatsapp, or messaging, you can add widgets to your home screen so that you know the latest contents immediately. BTW, in Moto G, email or messaging apps won’t display the number of un-read messages. Settings–Sound. Uncheck Screen lock sound. Could you please help me with having multiple icon for every email account. Currently except Gmail all the other email account shows under one icon. 2nd question is bout outlook folders notifications. how to configure it ? For the first question, I think there are no other settings for this. For the outlook folder, I’m not sure what notifications you are referring to. Email app only sends notification for new emails. My son downloaded a ringtone on my phone from Zedge; somehow it set itself as the notification sound as well and would not let me change it. I finally un-installed Zedge, now no matter what I do, I have NO notification sound at all. HELP!! Very likely, the sound file does not exist. In your message app, tap the menu key, tap settings. In notification section, make sure notification is checked, tap the sound, then choose one sound file. You may also check system settings at Settings–Sound. Under system, tap Default notification sound, choose a sound file that exists. I am have moto g since one month India version and now I am having of connectivity of is not even showing it is showing sim disabled. Please help me I have searched lot of time but could not fix it. Please help me out. Start gmail, tap the main menu (top left gmail icon), scroll down, tap settings, tap the email account, uncheck the notifications. This will disable all gmail notification for this account. If you want to play with label notifications, you need check notifications mentioned above, then go to the inbox, tap the menu (top right, 3 vertical dots), tap label settings. I would like to know how to shorten the length of time the ringtone for a call or message rather than it having play the whole song? Also, I know that there are notification displays at the tope of the mobile but I would like a message to display on the home page itself – is this possible? For the call, the length is determined by your carrier. If you don’t pick up the phone, it will play the ringtone for a specific time set by your carrier. For the notification tone for the messages, you need choose the short ones or provide shorter MP3 files. To display message on home screen, you can add the messaging widget. It is resizeable. Is there any way to turn off the vibration when using the keyboard for texting? I turned off the vibration for everything else but it still vibrates when I text and it’s driving me insane…. thanks! You need disable it in Settings–Language & input,tap setting icon for Google keyboard, uncheck “vibrate on keypress”. You are able to disable back button vibration also? Yes, it’s under keyboard settings: settings -language & input -Google keyboard. Uncheck vibrate on keypress. Hi..how can we on mobile speaker while running FM radio for avoiding hearing via earphone…please help. You can use bluetooth speaker. I can’t find any tips on my problem but this is the closest forum. I have zedge downloaded on my Moto G. I was in my alarm clock app and I accidentally selected to only select ringtones from my android device “always” instead of “just once”. I have absolutely no clue how to reset the default setting and I’m frustrated to the point of tears with this silly problem! Any help is greatly appreciated. Go to Settings > apps > menu > reset default apps to reset app preferences. I download “google voice” app and before the notifications would work; however, now I don’t receive any of these notifications. How do I fix it? It’s unlikely caused by Google voice. This app does not change your system settings. Hello my phone doesn’t ring at all. It only vibrates. I can’t hear any music or anything….. Only if I have on headphones. Please help!! It could be due to the faulty speaker. You can ask the vendor(or local service centre) to check or replace. I want to off the touch pad vibration inside the whatsapp. So from i will change touch pad vibration? I don’t think WhatsApp has own setting on this. It should be under global setting: Settings > Sound unselect “Vibrate on touch”. I don’t think this is a supported feature. You have to change station on the screen. Inside whatsapp, you can find the settings to configure the notifications or even disable notifications. When i am typing any password to unlock the phone / entering any message it is taking 2-3 seconds to complete the action..is there any problem in my phone.Generally after typing how much time it will take. 2-3 seconds are probably in the high end of normal response time. Normally it should be less than 2 seconds. Does a reboot help? But this also depends on many factors. Sometimes, cleaning background apps/processes may help. You may try Greenify app (https://play.google.com/store/apps/details?id=com.oasisfeng.greenify). Hi Moto mates I want to share an application that will help the moto g to enhance its sound profile functionality. ‘Smart Sound Profiles’ is an app in play store that provides you many more functions for ring tones, vibration, notification etc. Most of them are not inbuilt. And the best part is that you can control the notifications at the app level ie can customize the notification behavior for each app separately. Although this app has a trial version for 10 days but if you found it useful you can go for the full version as well. Hope it will help. How can I set my motog to vibrate+notification sound? All I can find is either sound or vibrate, but not both. You can set ringtone to none, but enable vibrate. Then for notifications, you set the tones accordingly. ALl these are under Settings. I used to be able to raise or lower the volume of my ringtones using the volume button, but now it only raises/lowers the volume of the sounds (i.e. For music, movies, etc). I am not able to find where to fix it back. Can you help? Thanks! Close all music players and other apps , return to home screen, press volume up button should let you adjust the volume of ringtone. When i plug in my moto g i used to get a notification sound which meant it was on charging. My phone is two days old. To be honest, I never notice the sound. You can reboot the phone to see whether it comes back. But if it can charge normally and works as expected, you probably don’t bother about it. How to stop notification sound vibrate facebook on MOTO G? I can’t found where I can turn off vibrate on Facebook notification. Thank you. You can set all notifications to silent. If you do not want to receive notification from Facebook, you can go to Settings–apps. Find Facebook app, then uncheck “Show notifications”. Hi, you’ve been a big help. Turned off notification from fb. But they sent these updates and I can usually swipe them off the pull down screen. I can’t get them off. Some are months old. Normally if you tap clear all, they should disappear. You can completely turn off notification of the app at settings-apps-facebook. – Use ‘Vibration’ option as you wish and enjoy. I need to know how can I reduce the vibration intensity of Moto G, it is way too much when on vibration mode. Motorola doesn’t offer the option to change the vibration intensity in Moto G.
Most apps require rooted phone. If you need set a different ringtone for an individual, you can do this in People app. Open the contact, tap the menu key (3 vertical dots), then tap Set ringtone. I am interested to know the way to disable the vibration of all apps in the normal (ringer only) mode without disabling them permanently in the settings of each app. I want the phone to vibrate only when its on vibration mode or ringer + vibration mode. I am asking it because my previous Samsung duos behaves in this way. I did not get it. By default, most apps don’t vibrate your Moto G. Do you mean notification? It is under Settings–Apps–sound–default notification sound. 2. Ringer + Vibration Mode. This is because, for instance, if you have put your phone on normal Ringing Mode at your home and notification vibration is ON suppose for a particular app. Your phone might be damaged accidentally due to falling down from a table or so. And to solve this issue we have to toggle the vibration settings again and again within the apps (eg. Facebook, whatsapp, hangouts etc) . As most of people use the vibration for outdoor purpose or in the silent place sometime. I got your points, but unfortunately, most android phones don’t work that way. Maybe, you can check whether there are some third party apps for this purpose. My search is on the way but no success yet. Anyway thanks for your assistance.